This native of Burgeis in Tyrol came to Bohemia probably as a trained carver and became a journeyman at the workshop of the sculptor Matyáš Bernard Braun. Theny was Braun’s youngest direct collaborator. He took part in the construction of Kuks, decorated the main altar in the Pilgrimage Church of Virgin May in Stará Boleslav. 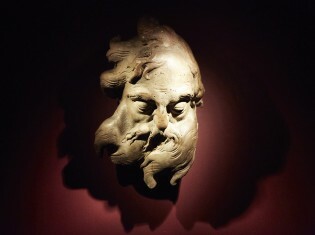 Around 1728, he became an independent master sculptor, married and settled down in Jaroměř. The following year, Řehoř Theny went to Žďár nad Sázavou, where Abbot Václav Vejmluva hired him for work at the monastic workshop and assigned to decorating the recently completed convent church and later on the pilgrimage church at Zelená Hora. It is believed that he imprinted the face of his deceased wife, Marie Klára, into the countenance of the cherub on the main altar of the convent church. 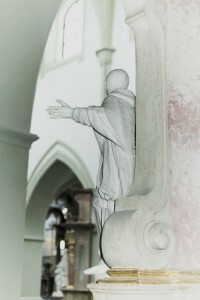 And the statue of Lucas the Evangelist on the Annunciation altar is said to be concealing his own countenance. Řehoř Theny created the model of the procession sculptor of St Jan Nepomuk, which was used by the Prague goldsmith, Jan Norbert Diesbach, for the silver rendition of Jan Nepomuk. Theny thereupon added decorated stretcher for it. Contrary to the original sculpture, this statue has been preserved to this day. He lived in Žďár for nine years and created there a number of masterpieces that can withstand comparison with the greatest artworks of his time. He left the monastery after Abbot Václav Vejmluva’s death in 1738, he workshop closed. 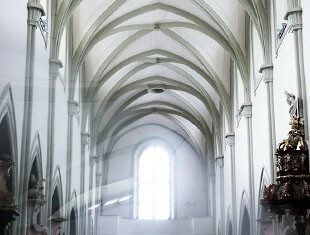 Theny returned to Jaroměř, and thereupon work on the altar of the monastic church in Kladruby, Prague, and around Jaroměř. He is buried at the local cemetery of this east-Bohemian town.